(VEN) - Hanoi has launched programs to help fine art and handicraft enterprises improve their products by overcoming the poor design that has hampered their development in the capital and elsewhere in Vietnam. Hanoi’s Phu Xuyen District is home to many famous bamboo and rattan ware production villages supplying the domestic and export markets. District fine art and handicraft articles are diverse in design and type and attractive to customers. However, like fine art and handicraft articles made elsewhere in Vietnam, those produced in Phu Xuyen need to be improved in terms of price and design in comparison with products of the same kind from other Asian countries such as Indonesia, the Philippines, Thailand, and China. Dam Tien Thang, Deputy Director of the Hanoi Department of Industry and Trade said the department told the Hanoi Industry Promotion Center to help fine art and handicraft enterprises in the city diversify and improve product designs to better meet customer demands. In 2018, the center helped 20 enterprises create two to five new product designs, with half the cost funded by the city’s industry promotion budget. 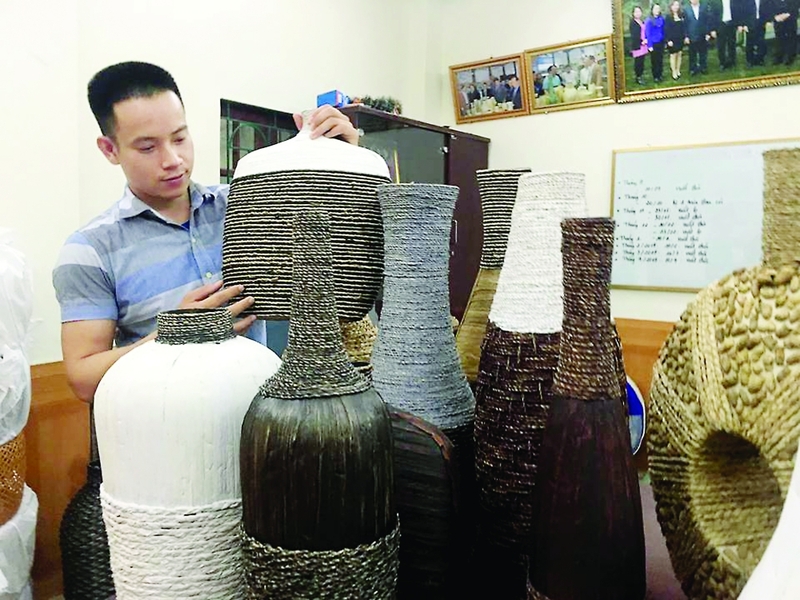 Nguyen Nam, technical manager of the Phu Ngoc Handicraft Export Co., Ltd. in Phu Xuyen District’s Phu Tuc Commune said Phu Ngoc is strong at making vases, barrels and other containers, with its products mainly exported to Europe. 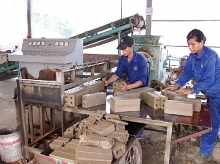 The company also produces pressed firewood pellets for export to China, the Republic of Korea (RoK), and Russia, and for use in industrial production, he said. The company has 30 employees and usually hires 20 more workers in the high season. 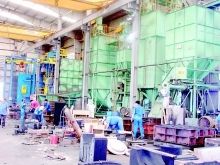 Its annual export revenue is about US$1 million, Nam said. The Hanoi Industry Promotion Center has helped the Phu Ngoc Handicraft Export Co., Ltd. design new products made of natural materials such as cornhusks, sedge, peanut husks, and water hyacinth purchased directly in Phu Tuc Commune, Nam said. In addition, the company produces bamboo lampshades for use in hotels and resorts, he said. Nguyen Khac Huan, owner of the Gia Nguyen Co., Ltd. in Giang Cao Village in Bat Trang Commune of Hanoi’s Gia Lam District said as the oldest ceramic and pottery production center in Vietnam, Bat Trang Commune makes a diverse range of ceramics and pottery. His company sells its high-quality ceramics and pottery in Europe, the US and Japan. This year, for the first time, Gia Nguyen accessed assistance from the Hanoi Industry Promotion Center to create new product designs. 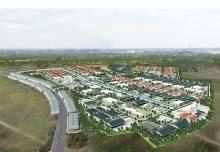 The result has been a significant increase in orders, Huan said. The Ha Thai Village in Thuong Tin District’s Duyen Thai Commune is renowned for its unique, high quality lacquer ware. Previously, Ha Thai only produced lacquer for decoration but nowadays its product range has been diversified to include other products for the domestic market and export. 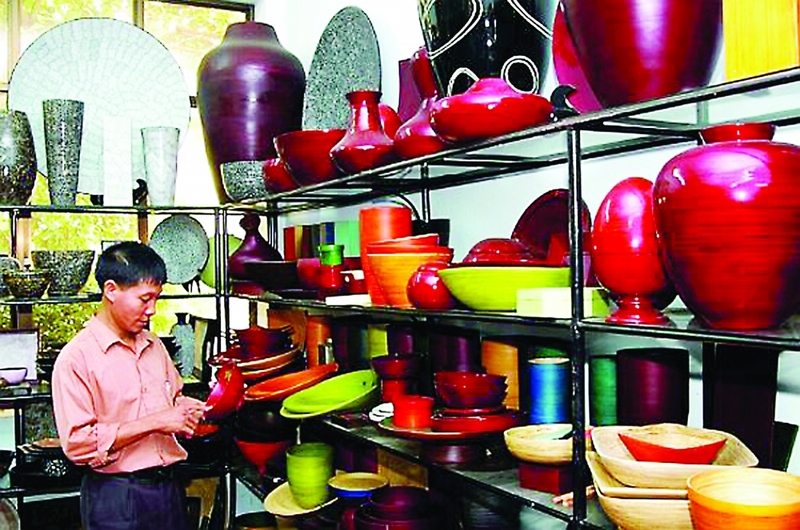 Do Hung Chieu, Director of the An Huy Trading Services and Production Joint Stock Company and Chairman of the Ha Thai Lacquer Ware Association said that 70 percent of lacquer products made in the commune are for export, and upgrading product design is a top priority. The Hanoi Industry Promotion Center has helped Ha Thai develop production, especially improve product design, for many years. This year, the center helped the An Huy Trading Services and Production Joint Stock Company create four new product designs, Chieu said. Design has been a major weakness of fine art and handicraft producers, who usually make products according to traditional designs or orders of foreign partners. Producers need to develop design if they are to succeed in market expansion.